Boundless Tales. I chose this name to convey the idea that we feature a wide range of writing genres as well as diverse writers. Aida Zilelian founded and curated the series. And still does so. Four readers are featured for the evening and each reader is allotted 10-15 minutes to read their work. It is a monthly series. Readings are held the second Thursday of every month. We take a hiatus in the summer for July and August. We are beginning our fourth year this September. We take submissions. Writers new to the series are given first priority. Many of our past writers also ask to be featured again. My goal was to provide a platform for emerging writers. What has happened, which is unexpected, is that now there are mid-level and more established writers that are featured in our series. 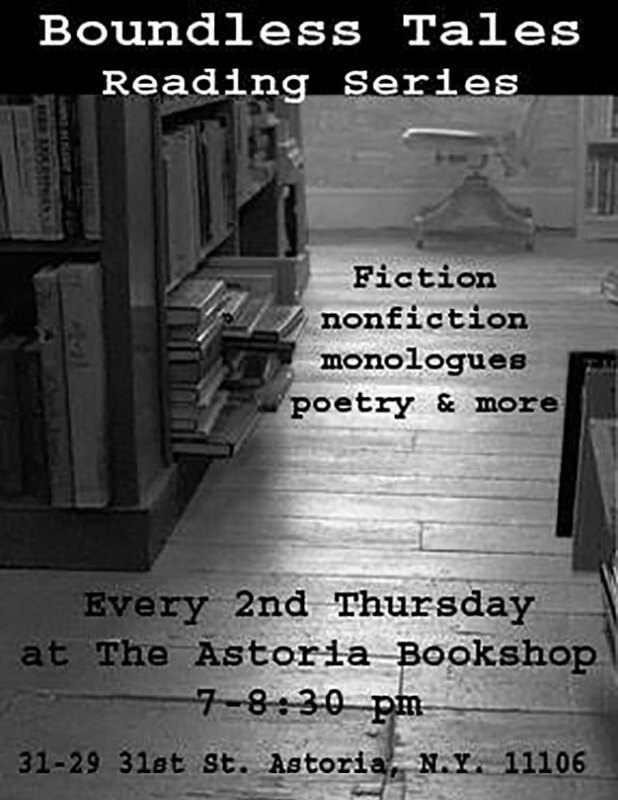 The next Boundless Tales is scheduled for Thursday, September 10, 2015 at Astoria Bookshop and features Jacqueline Tchakalian, Yi Wu, David Kutz-Marks and Marleen Barr.